Retro-commissioning is very similar to retrofits in that both seek to improve appliances and systems in a building in order to bring the facility to an increased state of efficiency. When considering energy usage and management its extremely important to be able to differentiate and target certain buildings that use more energy than others in order to help reduce costs. Fortunately, a very promising project has just begun called Telkonet that streamlines the individual heating and air conditioning units present in each dorm room. This has the potential of more than 20% savings on the annual energy bill. 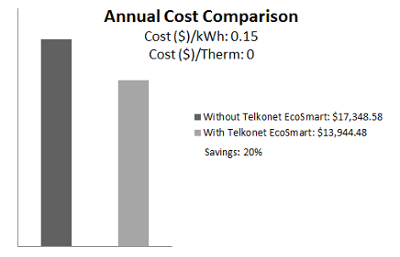 The figure below shows the projected annual savings from the installation of Telkonet software in the residence halls. The Telkonet system controls and connects individual packaged terminal air conditioners (PTAC), located in each room, to a central control system using thermostats and occupancy sensors. After installing this system in 57 rooms within Pralle-Sodaro Hall over spring break of this year, we are already seeing cost and energy savings that indicate an easy return on investment should the system be expanded to other eligible rooms. HVAC (heating, ventilation and air conditioning) units are one of the biggest sources of energy consumption, usually accounting for anywhere between 17-49% of the average annual electricity bill. Therefore, such a costly area should be a high priority project to be worked on. The figure below shows the distribution of energy in Chapman's residential buildings. 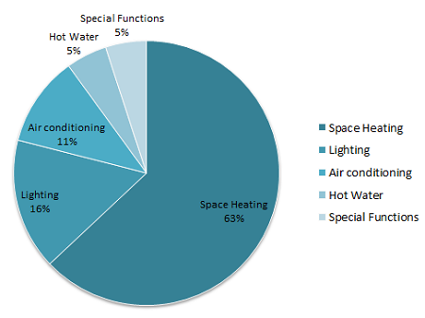 From this it can be seen that a large percentage of energy (74%) is required by HVAC systems.